All Things Dog Blog and our Event Barkers partners, DogTipper.com and ToDogWithLove.com are sooo excited to share this very exciting Twitter Party announcement. We're thrilled to play a small part in this charity effort that will raise needed funds for the the Dog and Cat Cancer Fund (DCCF). The Dog and Cat Cancer Fund is a non-profit organization dedicated to understanding, treating and preventing canine and feline cancer. Zuke's is out to help pet parents challenged by the costs of cancer treatment, by donating $5 for every tagged photo shared with the hashtag #FueltheLove. That donation sounds like a whole lotta love, yes?!!! As you share your photos of your dog in action and loving life, Zuke's will Fuel the Cure with their donations. Doesn't that make you feel all warm and fuzzy?!!! So join us on Instagram, Facebook and Twitter by sharing your photos and videos with the #FueltheLove hashtag and @ZukesPets handle--one photo or video per pup, please. Don't forget to follow @ZukesPets on Instagram so you can watch the fun-filled entries. Your participation on social media and in the Twitter Party will help families get financial support to see their pets through treatment. Pssst...did you know that there are approximately 6 million dogs diagnosed with cancer each year? Many are unable to opt for treatment due to the high cost. That's where you can help with your Tweets and social media sharing of your dog's action photo. Are you wondering how much money we're talking about? Last year this fund-raiser chalked up $2,500, but this year Zuke's is aiming much higher--$10,000! So hunt up your best pet pic of each of your furry friends and let 'em rip with #FueltheLove @ZukesPets. We can't wait to see your best friends. 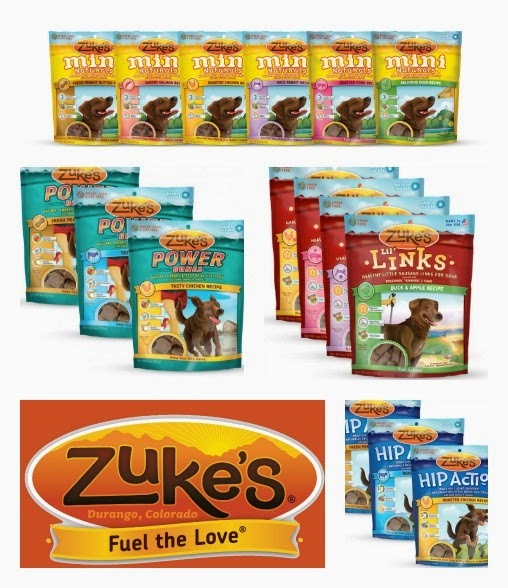 To learn more about how Zuke's will help the DCCF, join us for the #FueltheLove Twitter Party Sunday, June 22, when we'll be handing out loads of prizes--Zuke's dog treats, of course! Even if you can't make the party, you can still join in our pre-event giveaways. Three winners will score a pile of treats valued at about $70, enough to keep your pup's sweet tooth tuned up for quite a while. The remainder of the total $750 in prizes will be awarded during the Twitter Party, so mark your calendar for June 22 and plan to bring your dog pics for some photo sharing fun. To enter to win our pre-event giveaways, simply use the Giveaway Tools form at the bottom of this post. If you don't see it down there, it's probably off working to #FueltheLove. You can bring it back on duty by simply clicking the post title to alert it. Enjoy the variety of entries, using only those you choose. Keep it fun and remember that this is all to help the DCCF raise money to help families like yours in need of treatment dollars. Thanks for participating. One last little tidbit: To help you remember the event, and also to give you a place to record your questions, we've created a printable flyer to place beside your computer or on your refrigerator. Now you can be ready and oh so organized on the night of the event! We are working with Zuke’s through our partnership in Event Barkers to produce this Twitter party and share this charity event with our readers. Prizes will be provided and shipped by Zuke’s. All opinions expressed herein are our own. The Zuke's #FueltheLove photo submission program is open through July 31, 2014. Don't forget to tag your photos with @ZukesPets #FueltheLove. Thanks for helping!